Behind every great pressroom is a great toolroom, equipped and staffed to move new dies from the design center efficiently through production, and to also return production dies requiring maintenance back to the presses in a timely manner. Toolrooms also are tasked with supporting assembly and welding operations, by manufacturing jigs and fixtures. We interviewed managers at three metalforming companies to learn how each is equipping its toolrooms to be the perfect partners to their production-manufacturing operations. Part 3 of 3. The 16,000-sq.-ft. toolroom at metalformer Batesville Tool & Die (BT&D), Batesville, IN, employs 76 professionals who primarily focus on integrating engineering changes to existing automotive dies. New-die design and build comprises about 40 percent of toolroom activity for the automotive stamper. In 2010, the BT&D toolroom built or re-engineered some 200 dies, and expects to handle the same volume of work in 2011, focused on keeping its 40 production-stamping presses up and running. When we caught up with machining manager Toby Walsman, six dies occupied his toolroom benches—two new dies and four undergoing development to handle engineering changes handed down by customers. While ensuring that production dies stay in the presses as much as possible, with minimal time spent on a toolroom bench for maintenance, Walsman has been focused in recent years on ensuring that the BT&D toolroom operates at optimum efficiency and productivity— and profitability. In his journey to building a lean toolroom, Walsman explains how he and his team have perfected a routing system that tracks and controls all die details moving through the toolroom. “We built a tracking system using Excel and a kanban pull system to manage production,” Walsman says. “When we build a new die, we review the tool carefully and look at each station, and then determine the inventory of spare die components we should maintain in our crib. We consider the volume of parts the die will stamp, type of material, etc. Then we build up the spare-parts inventory we think we’ll need and plug the data into the kanban system, which also is used to track die-maintenance activity in the toolroom. This inventory management and control of our spare die components then triggers, from the Excel database, the release of purchase orders for the toolroom. To achieve those goals, Walsman and his team have instituted several changes to their operations. 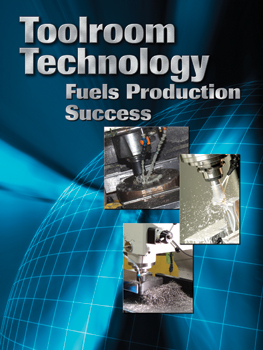 For starters, the firm invested in Surfcam CAD-CAM software and in AutoForm die-design and manufacturing software. BT&D engineers use AutoForm to perform stamp and draw simulations, evaluate die-design iterations and minimize the trial-and-error die-design and build process. “We’re focused on helping our customers move new tools into production as quickly as possible,” says Walsman, noting that the company used to outsource die simulation and virtual tryout before bringing it inhouse in 2010. “With upfront design support using AutoForm, we can identify trouble areas and catch problems in design before the tool is detailed. The BT&D toolroom uses this new 7.5-hp heavy-duty knee mill, running a Niagara solid-carbide mill, to hog material for machining of die shoes and parallels. It’s one of three new CNC mills contributing to productivity gains in the toolroom, along with two new CNC lathes, aided by a recent switch to a new semi-synthetic coolant. heavy-duty machine used to hog material for machining of die shoes and parallels. “We prepare all of our dies for quick changeover,” says Walsman, “so we run them all at the same shut height. That’s where the higher-hp mill really helps. And it’s also very productive when milling die shoes to accept scrap and parts chutes.” The FHM7 knee mill boasts a 60- by 21-in. table and a speed rating of 200 to 5000 RPM. Other knee mills in the toolroom are FHM5 models—5 hp, 31- by 23-in. table, speed to 4000 RPM. Along with his new lineup of CNC machines—including two 10-hp 17-in.-swing CNC lathes—Walsman also switched machining lubricants, in 2009. The new coolant of choice: a semi-synthetic coolant called Syn-Plus, provided by Solutions Plus Inc., Amelia, OH. Walsman credits the coolant not only with prolonging tool life—by as much as 20 percent—but also with allowing operators to increase machining speeds and feeds in many cases. 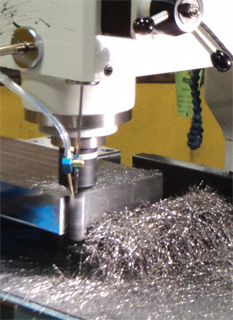 Cutting tools also have received attention in Walsman’s toolroom, where new solid-carbide ball mills from Niagara Cutter, Inc., have been credited with significantly decreasing machining time and increasing milling-machine throughput. The toolroom has been using the new mills—3⁄8- to 1-in.-dia.—since October 2010 and operators find them more durable than other carbides they’ve used. “Material finish is better,” adds Walsman, “and we’re experiencing major reductions in polishing time. See also: AutoForm Engineering Gmbh, Niagara Cutter, Southwestern Industries, Surfware, Inc., Solutions Plus Inc.